Throughout the Star Wars saga, the Galactic Empire forms a single, terrifying entity, ruling the galaxy with an iron fist and crushing resistance wherever it arises. Yet not all is darkness and oppression. Against this monolithic Empire, a rebellion has arisen. Formed from a motley assortment of politicians, soldiers, engineers, pilots, and smugglers, the Rebel Alliance stands against the atrocities and fear perpetrated by the Imperial forces on a thousand planets. Anyone willing can join the Rebel Alliance, and now, you have your own invitation to sign up with the Rebellion when you play as the Rebels in the Star Wars™: Legion Core Set. Last week, we took a closer look at the forces of the Galactic Empire in Star Wars: Legion, led by the Dark Lord of the Sith, Darth Vader. Today, we turn our attention to their opponents in the Galactic Civil War, the noble men and women of the Rebel Alliance! 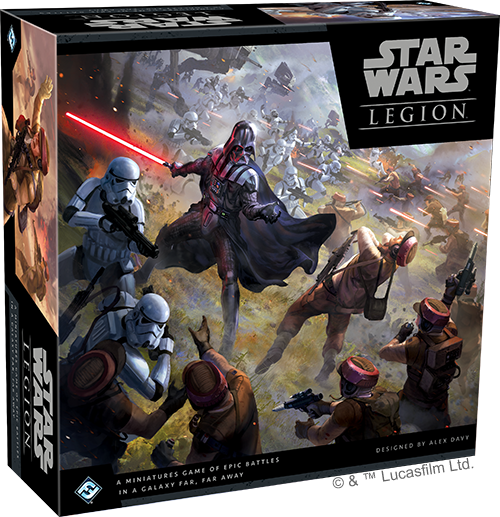 Star Wars: Legion hits stores on March 22nd, with the Core Set and eight other expansions releasing simultaneously. You can pre-order your copy of the Star Wars: Legion Core Set at your local retailer or online though our webstore today! From his humble origins as a farm boy on Tatooine, to the destruction of the first Death Star, to Jedi training with Yoda and beyond, Luke Skywalker has played a pivotal role in the unfolding Star Wars saga. It’s only natural that you should find him as the Rebel commander in the Star Wars: Legion Core Set, leading your troopers into battle on another unsung battlefield of the Galactic Civil War. Like Darth Vader, Luke Skywalker shines brightest when fighting in the center of the battle. Though he lacks the raw prowess of Darth Vader’s lightsaber mastery, Luke Skywalker does have several distinct advantages. First, he’s cheaper than Darth Vader by forty points, potentially leaving you room to marshal an entire extra squad of Rebel Troopers. Secondly, Luke Skywalker is much more mobile than Darth Vader, using the speed-2 movement tool, rather than the speed-1 movement tool. Not only can Luke cover more ground, he can also clear low terrain with Jump 1. This ability lets Luke use one of his actions to make a move that ignores low terrain, helping Luke leap exactly into position to cause the most damage to the Empire. Then, after you complete your move with Luke, you can immediately perform a free melee attack using Luke’s Charge ability! As his melee weapon, Luke Skywalker wields Anakin’s Lightsaber. Though he’s not as proficient with it as Darth Vader, Luke is still powerful. 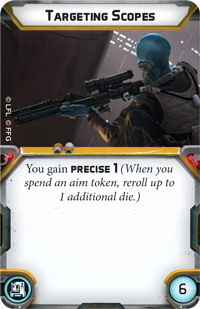 You’ll roll six black attack dice when attacking with Anakin’s Lightsaber, while the Impact 2 and Pierce 2 keywords help you puncture vehicle armor or cut through any blocks that your opponent may roll. Fighting with a lightsaber also makes Luke Skywalker immune to the Pierce keyword, and can help him deflect incoming lasers back at your foes. 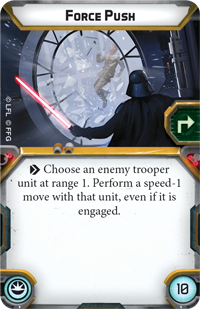 Like Darth Vader, Luke Skywalker has the Deflect ability—so long as he has a dodge token, you can turn defensive surges into blocks and deal damage back to the attacker for each defensive surge you roll. Luke does have another major advantage—rather than only being equipped with a lightsaber, he also wields a DL-44 Blaster Pistol. Gaining a ranged attack (even if it only extends to Range 2) is a powerful advantage, and two red dice with Pierce 2 gives you very good odds of dealing two damage with every attack. What’s more, you could equip Luke with Targeting Scopes to gain Precise 1 and make your attacks with your lightsaber or your blaster more likely to hit, so long as you take the time to aim before attacking. In addition to the gear upgrade slot, Luke Skywalker can take up to two Force upgrades. Like Darth Vader, Luke can choose powers like Force Push or Saber Throw, but you may choose instead to mold Luke Skywalker into a commander who has a greater influence on the entire battlefield. 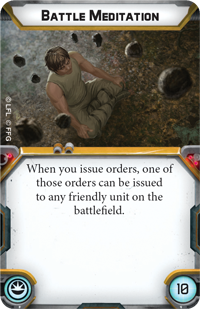 Battle Meditation lets you bypass the normal rules of issuing orders to give one of your orders to any friendly unit, no matter how far away they may be. Alternatively, you might employ a Jedi Mind Trick, dumping two additional suppression tokens onto an enemy trooper unit! 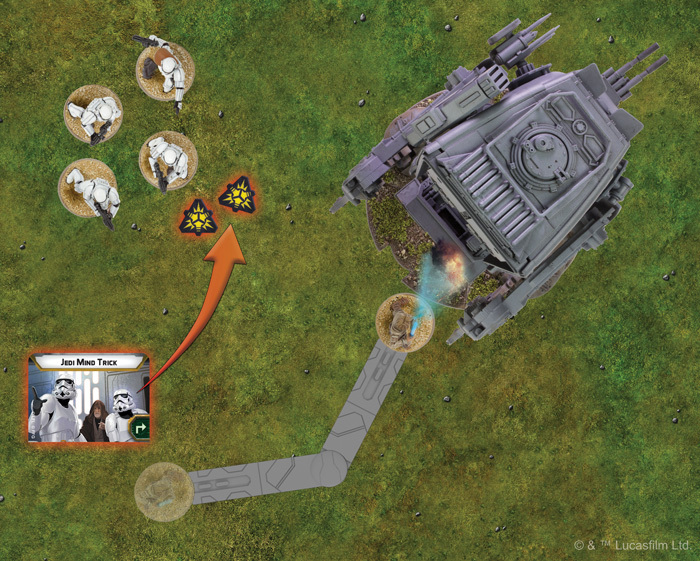 If you’ve already been concentrating fire on an enemy unit and piling up suppression tokens, adding two more with a Jedi Mind Trick may be just enough to completely panic the enemy unit and force it to break and flee. Luke Skywalker pins a squad of Stormtroopers with his Jedi Mind Trick, then charges to engage the AT-ST in its weakened rear hull! 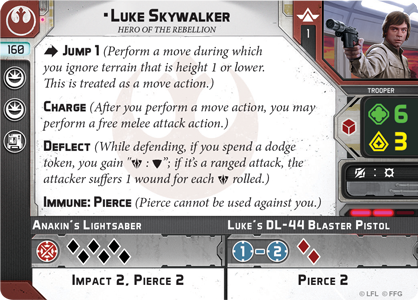 Luke Skywalker is a powerful combatant, but like every commander in Star Wars: Legion, he also has the ability to shape the unfolding battle through his three personal command cards. These command cards reflect some of Luke’s trademark strategies, tactics, or beliefs, and we’ll take a closer look at them, along with Darth Vader’s command cards, in a future preview! Within a Star Wars: Legion Core Set, Luke Skywalker isn’t taking on the whole Empire himself. You’ll also find the Rebel units that Luke leads into battle, starting with two units of Rebel Troopers. These troopers have dedicated their lives to fighting on the front lines of the Rebellion. 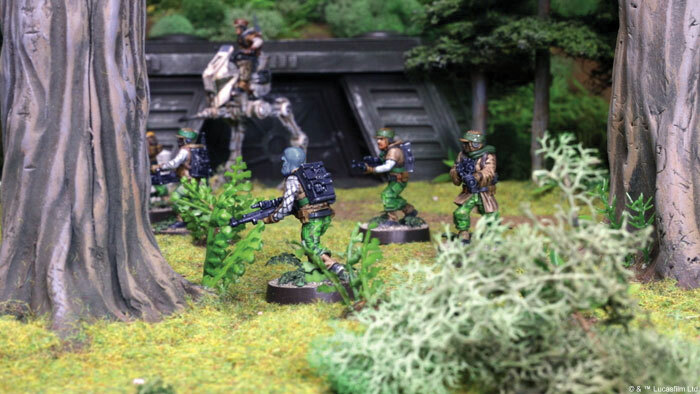 Though they’re outnumbered and outgunned by the military might of the Galactic Empire, their training helps them to stay mobile and make every shot count. During a battle of Star Wars: Legion, your Rebel Troopers take the fight to the Empire armed with A-280 Blaster Rifles. These weapons are more accurate than the Empire’s E-11 blasters, giving a Rebel Trooper’s barrage of lasers a better chance of actually connecting with your target. 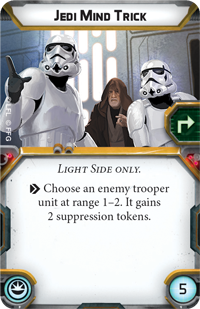 What’s more, your Rebel Troopers are Nimble—an ability that gives them a dodge token after they spend a dodge token in defense! That added mobility comes with a price, however. Rebel Troopers wear little armor, which keeps them using a white defense die rather than the more consistent and powerful red defense die. 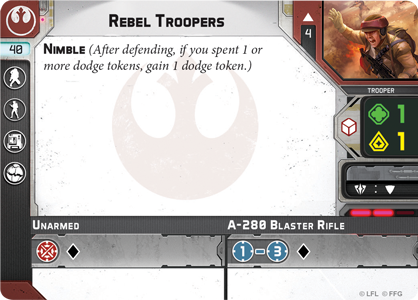 Rebel Troopers spend a dodge token during an attack, and their Nimble ability immediately grants them another dodge token! As your Rebel Troopers and Luke Skywalker lead the onslaught against the Empire, it helps to have another unit that can anchor your army. Enter the Rebellion’s salvaged AT-RT. This small walker, while no match for a monstrosity like the Imperial AT-ST, still has a powerful degree of armor that keeps small arms from making much of an impact without a lucky critical hit. What’s more, the Climbing Vehicle and Expert Climber abilities combine to let your AT-RT make its way up and over terrain that would otherwise prove impassable to larger vehicles. AT-RTs are inherently gifted with Grappling Claws, which can tear through enemy units in a melee. 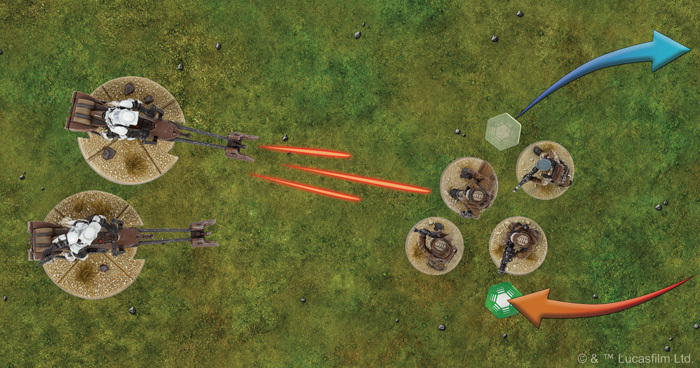 While you’re still at range, however, the AT-RT has a variety of options for ranged attacks. The AT-RT has only a single hardpoint upgrade slot, but there are three different hardpoint upgrades that you may choose to equip onto your AT-RT. 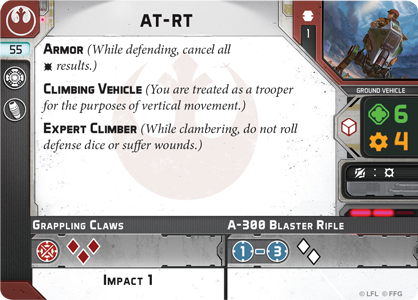 Depending on how you want to use it, you may load your AT-RT with a rotary blaster, a laser cannon, or even a flamethrower—we’ll take a closer look at each of these weapons and the damage that they can cause in our preview of the AT-RT Unit Expansion. The Rebel Alliance has survived in the face of outstanding adversity and stunning odds, because its members never abandoned hope—from heroes like Luke Skywalker to the rank-and-file troopers fighting on the front lines. 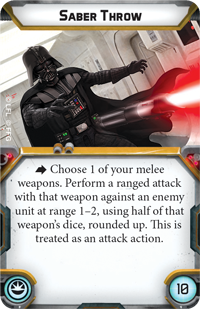 Join us for our next preview of the Star Wars: Legion Core Set for a closer look at how you can command your armies with Luke Skywalker and Darth Vader’s command cards. Pre-order your Star Wars: Legion Core Set (SWL01) and the eight expansions releasing alongside it at your local retailer or online through our webstore today! Look for Star Wars: Legion to hit stores on March 22nd.